First time in Japan? You're not the only one. Between 20 September and 2 November, Japan will stage Asia's first Rugby World Cup, and this country of 127 million people is expecting about 400,000 visiting fans from across the world. Konichiwa Nihon! Visitors to Japan often think they're in for a culture shock. The food, the customs, the language (you will find the basics here)… all of it seems alien, strange and impenetrable. In practice, it's nothing of the sort. Imagine a world where the trains always run on time, where there are convenience stores and vending machines everywhere, and where the food is downright delicious even in a shabby-looking corner cafe. Where there's ultra-modern tech alongside ancient temples and gorgeous countryside. Where you can bathe naked with strangers each night... say what? OK, Japan does have some unusual customs but read our guide and you're not going to get caught out. 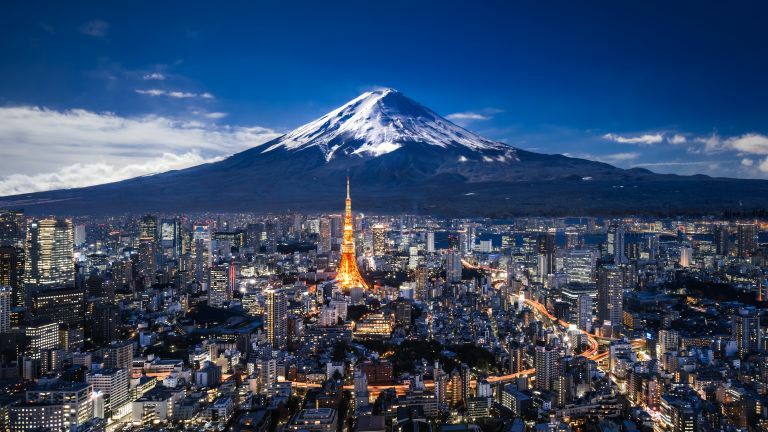 With 38 million people living here, Japan's capital is where you're likely to arrive and depart. If you can possibly choose a west-facing hotel room on a high floor, do so; that way you might glimpse Mount Fuji, which is often shrouded in cloud. In spring, Japan's cultural capital sees a scrum of tourists all wanting to take photos of blooming cherry blossom (yeah, that's a thing), so time your visit carefully. Whenever you arrive, there are over 1600 Buddhist temples here to keep you entertained… and almost as many Zen gardens. You've heard of capsule hotels? Now forget all about them. Yes, they exist, and no, they're not much fun to stay in since they're designed for people who drink too much and miss the last train home. For something altogether more authentic and interesting, try to find yourself a traditional Japanese hotel called a ryokan. Rooms have tatami mats on the floor and a tea table in the middle that always contains a hot water flask and a tea set. Some ryokans serve food in your room at your tea table. While you’re out at any point in the evening, the staff will lay a futon mattress on the floor for you. Oh, and you’re given a yukata robe and slippers to wear all around the hotel… even to breakfast. You won't find ryokans much in the big cities, where western-style hotels dominate, but basic versions are common in smaller towns, and in the countryside where they're more likely to be high-end rural resorts, and almost always include onsen. It seems intimidating, but bathing in a Japanese onsen can quickly become an obsession once you get the hang of it. Although there is public onsen, most are within ryokan. Each venue has two onsen, one with blue curtains for men (and the 男 character) and one red for women (女 character). Young kids can go in either with their parents. Step inside and you will find baskets for your clothes, and a flannel to protect your modesty. Get naked, walk into the main washing area, and sit on a small wooden stool and shower yourself down. Then get into the extremely hot water pool (sometimes outside, but usually inside) and stay there, likely with strangers next to you, until you can't take any more heat. Got tattoos? Forget onsen; tattoos are associated with organised crime syndicates. You are banned. If naked bathing is the big worry for gaijin (foreigners), then this is the number two, so to speak. Standard issue even in public loos, high-tech ‘washlets’ – usually from the TOTO brand – comprise a seat warmer and bidet-like cleaning features. The control panel makes it pretty obvious what you want to clean; ‘front bottom’ or ‘back bottom’. Hit the button and a jet of warm water will do the rest. There’s even a built-in bum-dryer. Why doesn’t anyone import these to Europe? You're going to have a lot of fun eating in Japan. You know about sushi, sashimi, and probably tempura and ramen noodles, too, but there are a ton of other dishes in Japan that are less common abroad (as well as a lot of Korean restaurants). Ordering is simple thanks to the prevalence of pictures on menus, if you're in a big city, plastic replicas of meals displayed in the window. Yes, Tokyo does have the most Michelin-starred restaurants in the world at 230, but there's no need to go to any of them – the standards are so high generally that you don’t need to spend big. Sukiyaki: a hot-pot of beef, vegetables and noodles in a sweet broth. Tonkatsu: deep-fried pork cutlet served with sweet brown sauce. Yakitori: skewers of chicken grilled over charcoal. Okonomiyaki: an omelette-like batter and cabbage dish with hundreds of possible additions.